Remarkable Marketable Me: This nation will remain the land of the free only so long as it is the home of the brave. Helping the brave come home! This nation will remain the land of the free only so long as it is the home of the brave. Helping the brave come home! In 2005, Dan Wallrath, a custom home builder in the greater Houston area, created the non-profit organization, Bay Area Builders Association Support Our Troops in response to the housing needs of the disabled veterans and their families. This non-profit organization provides custom made, mortgage free homes to wounded and disabled veterans from Iraq and Afghanistan and the widows of the fallen in an effort to get their lives back on track and become productive members of their communities. Click on the link above to see the Smile Charity main page! whom were left disabled after sustaining injuries while serving their country inIraq.Additionally,during the concert event, Smiles Charity will honor two local fallen heroes, Brandon Bury and Cody Board, who made the ultimate sacrifice in 2010 while serving in Afghanistan.Supporters are encouraged to volunteer during the concert as hundreds of volunteers are needed to make the concert and festival a safe and successful event. This year’s event will have a special need for active and retired military members to volunteer in uniform. 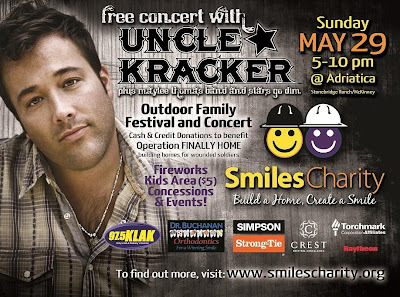 Please register to volunteer at www.smilescharity.org and click on the volunteer tab. 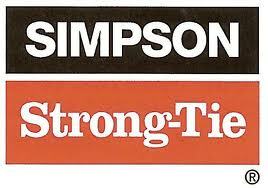 Simpson Strong-Tie proudly supports Smiles Charity, a McKinney basedcharity whose mission is raise money to build homes for deserving localfamilies by bringing the community together. Smiles Charity, who in the pasthas funded the build of three Habitat for Humanity homes, is now partneringwith Operation Finally Home to build mortgage free homes for severelywounded soldiers. One of the soldiers receiving a home from Smiles Charitythis year is Alan Hornaday who was not available due to recurring pain fromhis injuries, and the other is Levi Wilson who was on site with SimpsonStrong-Tie to see the upgrades made to his home.On January 18th, 2008 Levi was severely wounded by an IED while riding in a Stryker vehicle. After the blast, Levi woke to find himself pinned under the meta and in the middle of an ambush. The ambush hindered medical evacuation and Levi remained pinned until an air strike cleared the insurgents. Surviving abroken back and multiple broken bones, he endured months of surgeries and therapy while at the same time earning his Bachelor‟s degree in criminal justice.Throughout his military career, Levi was awarded several awards including the Purple Heart and the National Defense Service Medal. “I am honored to be receiving a home,” says Mr. Wilson. Operation Finally Home Dan Wallrath founder and president says, “There are 38,000 soldiers returning home with lifealtering injuries. Alan began his military career in July of 1986 when he joined the Arkansas National Guard. He was a member of B Co 3rd/153rd Infantry as part of the AR 39th BCT. Alan’s time with the Arkansas Guard included multiple international training missions with multiple international forces, and two overseas deployments. Alan also received multiple commendations and awards during his time of service, including the Arkansas State NCO Leadership Award. His deployment to Iraq in support of Operation Iraqi Freedom would bring the defining moment of his military career. The AR 39th BCT arrived in Iraq in February 2004. By April, the Brigade had already suffered multiple attacks and casualties. On May 6, 2004 Alan and one of his squads were manning Checkpoint 11 at the entrance of the Green Zone. While watching over his men as they checked the IDs of pedestrians and those driving vehicles across the 14th of July Bridge entering the Green Zone, Alan noticed a small taxi approaching and driving erratically. As it drew nearer, he could see that it was heavily laden. He also locked eyes with the driver. The cold dead stare gave away his intentions. Immediately, Alan shouted to his men to take cover. Alan turned to shoot the drive and at that moment, the driver donated the IED. Alan was propelled through the air and slammed against a blast wall. Sand bags from the top of the wall fell on and around him. The engine block of the bomber’s vehicle landed on Alan’s legs. Alan received medical treatment in Baghdad and was flown immediately to Landstuhl, Germany and then onto Walter Reed, Washington D.C., and finally to Brook Army Medical Center Burn Unit, in San Antonio where he remained for 22 months. Alan was medically retired from the Army and do to his injuries is 100% disabled. More than anything, Alan misses the military and the men who became closer than family during the times they served together. Levi joined the Army and departed to Fort Benning, Georgia on April 24, 2007 for basic training. Upon completion of basic training Levi was ordered to his first duty assignment at Schofield Barracks, Hawaii. Levi had been with the 2nd Brigade/25th Infantry Division only four months before being deployed to Iraq on December 7, 2007. On January 18, 2008 Levi’s platoon was doing a route clearance patrol to clear the roads and buildings of enemy threats and improvised explosive devices. After several miles of route clearance, Levi’s Stryker vehicle was hit by a deep-buried improvised explosive device. Levi woke up shortly after to find myself pinned under the metal from the explosion (Approximately 9 soldiers were wounded (including Levi), one was killed, and two and half years later, one is still in a coma). After the explosion Levi’s unit was ambushed and had to call in air support to lay down suppressive fire. The medics were not able to get the wounded out of the vehicle for 20 minutes due to the ambush. Once freed Levi was air lifted to the hospital in Balad, Iraq and on to Walter Reed Medical Center in Washington D.C. After a few weeks of surgeries, Levi requested that he be sent to Brooke Army Medical Center in San Antonio, Texas so he could be closer to home. Levi sustained a broken back (L2-L4), broken jaw, broken left leg (tibia-fibula open facture), calcaneal fractures to both heels, broken right ankle in 3 places and his tongue was bitten nearly in half. During Levi’s rehabilitation process him and his wife (Katie) both started taking online classes and on May 30, 2010 Levi and Katie graduated with (Katie/Business Administration & Levi/Criminal Justice) Bachelor’s Degrees! Levi was officially retired from the Army on June 25, 2010 and is pursuing a career with Immigration and Customs Enforcement and plans on getting his Masters Degree. Please help our cause by donating. Your donations are a vital resource and are greatly appreciated! You can donate in many different ways. if you would like to send money now safely and securely. You can also contact us if you have any questions on any other methods. in the McKinney, TX area. You will be redirected to the PayPal site to complete the process. This will be done securely using encrypted communications. Click here for more information on how PayPal works. There is no greater feeling then being able to give of one's self. BUILDERS: We need builders from across the nation to build homes for America's war wounded. DEVELOPERS: We need developers from across the nation to donate lots or sell them to us at cost so we can build homes. BUILDING SUPPLIERS: We need building suppliers to donate materials to build the homes. AMERICA: We need American's across the nation to hold an event in their home towns. Raise awareness and funds to build a home for America's severely wounded service members, widows of the fallen and their families. Volunteer for one of our events in your area. 100% of your donation goes towards building mortgage free homes for America's war wounded, their families and the widows of the fallen. Operation FINALLY HOME is a Non-Partisan / Non-Profit 501(c)(3) organization. mortgage free homes to wounded and disabled veterans and the widows of the fallen in an effort to get their lives back on track and become productive members of their communities. Bay Area Builders Association Support Our Troops partners with corporate sponsors, builder associations, builders, developers, individuals contributors, and volunteers to help severely wounded heroes and their families’ transition from the battlefront to the home front and help them succeed in their challenging new world so they may ultimately enjoy a productive and rewarding life. Great people are still out there !